The 19RCS Costa Corsa is the latest development in the field of radial master cylinders. 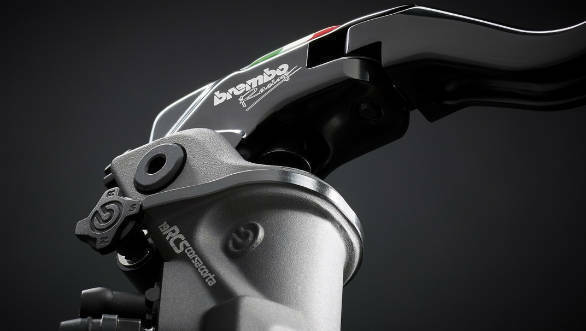 This development by Brembo has its origins in motorsport and has been launched keeping in mind high-end motorcycles which need a braking solution that can be adjusted to perform optimally in all conditions. For those who came in late, a radial master cylinder (and a radially mounted calliper) are the latest in braking hardware for motorcycles. But let's look closer. What is the radial master cylinder and why is it significant? 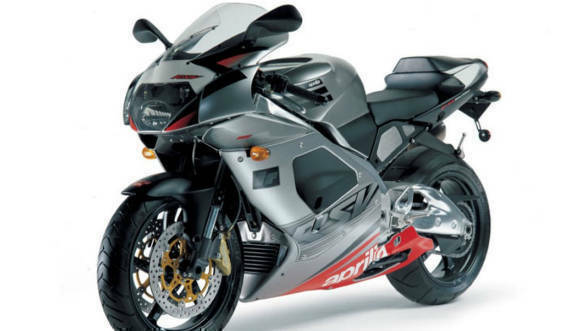 The master cylinder was a big change in braking technology when it debuted in 1985 on race bikes and then became a production item on the 2002 Aprilia RSV 1000. In racing, it was created to be compact and light. And it also added better rider ergonomics, more feel and more power to the braking itself. How? The system's design essentially allowed the rider's fingers to generate a force that never needed to change direction as it went from the lever to the piston in the master cylinder and from there down to the calliper. The system did this by placing the master cylinder in the yoke on which the lever is mounted. Effectively placing the hydraulic piston's axis perpendicular to the handlebar and hence its name. How does the 19RCS improve on this technology? Given that the eventual aim of motorsport is almost always to improve or simplify the manufacturer's road-going offerings, it is unsurprising that advancements in a particular tech still in popular use never really stop. The case has been the same with the radial master cylinder and the 19RCS Corsa Corta is a classic example of this. 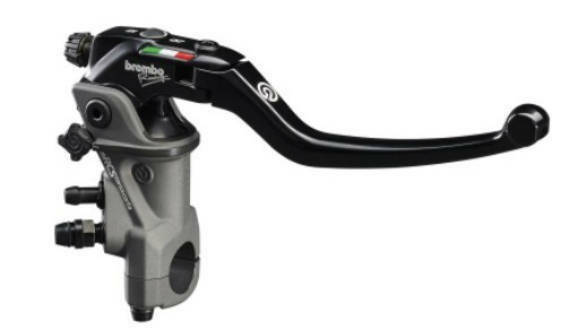 The most significant development with the 19RCS Corsa Costa is that this radial master cylinder arrangement now lets the rider fiddle with the 'bite point' of the brake, with a selector on top of the master cylinder itself. The selector is operated by a cam mechanism which allows users to choose three preset responsiveness levels-Normal, Sport and Race. In the normal setting, the beginning of the bite point is more gradual, making it better suited for city riding or braking in low grip situations. In the sports setting, the beginning of the bite point is shorter than in the normal setting producing a more dynamic response for sportier riding. Lastly, the race setting shortens the position of the cam mechanism at the initial stage of the 'bite point' even further, producing an immediate response and letting the rider reach the bite point of the brakes instantaneously. This is ideal for the race track where the milliseconds saved with every braking action add up to larger gains over the course of the race. The adjustability of the Costa Corsa is further accentuated by the RCS(Ratio Click System) system it also employs. With this system, the rider can adjust the point around which the brake pedal leverages itself with respect to the brake piston. This changes the braking action and feel. Two settings are available, 18mm and 20mm. The 18mm leverage setting is the more track-oriented option, allowing increased lever travel while delivering added power and modulation feel. The 20mm set-up is more suited for daily driving needs and gives the rider a firmer lever feel with slightly reduced overall power and sensitivity. This RCS changes the distribution of the braking force without altering the performance of the system in terms of pure power. An overall effect of this, when combined with the three bite point settings, is that it lets the rider tailor the motorcycles' braking performance to suit their riding style, the weather or road conditions. Can the 19RCS Costa Corsa help in the real world? While this technology originated in MotoGP, the benefits of this tech in road-going applications are fairly evident. With roadgoing supersport and naked motorcycles, and sometimes even adventure tourers reaching exceptional levels of performance, solutions like this can improve the riding experience by some margin. This is primarily due to the confidence a good braking action inspires, the improved pace and the consequent safety benefits. A drawback could possibly be that the system might only be fully exploitable by highly skilled riders and that the setup changes may only be discernible by the most competent rider. A majority of the general riding public might not be able to utilise the benefits of this system to its fullest possible extent, making these advancements moot.